“Who loves pizza?” is a question you almost never have to ask an American. Now, there is a place for all pizza lovers to gather: the newly-opened Museum of Pizza. It can be found in America’s pizza capital — New York City. A company called Nameless Network came up with the idea for the museum, known as “MoPi” for short. “It’s often that the simplest ideas are the best,” said Alexandra Serio. She is with Nameless Network. The company used the popularity of pizza as a way to get people “looking at art and hearing about history in a different format,” Serio explained. 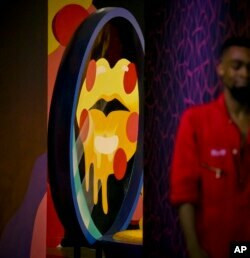 A three-dimensional sculpture from artist Shawna X called "Say Cheese," is part of a group art exhibition celebrating pizza at The Museum of Pizza in New York, Nov. 2, 2018. MoPi is a “pop-up” museum – meaning it can be enjoyed only for a short time before being moved somewhere else. Visitors seem to love MoPi’s bright colors, which makes it perfect for taking selfies and other photographs for social media. But instead, Raye got some of everything. “So you get a little bit of education and then some fun, which I love," she said. Nameless Network’s Alexandra Serio said that, in recent years, art museums have changed as they’ve aimed for younger visitors. They are becoming more interactive and photo-friendly, she said. 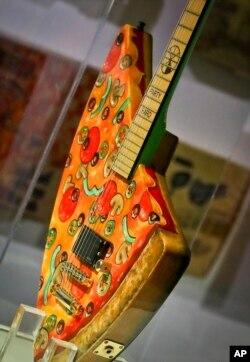 The "Pizza Guitar," from musician Andrew W.K., is part of a group art exhibition celebrating pizza at The Museum of Pizza in New York, Nov. 2, 2018. “I thought it was going to be kind of boring,” she said. She imagined walking in and finding books on how to make pizza. 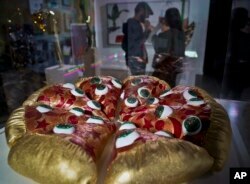 Serio said the Museum of Pizza’s crowds are unlike the crowds at more traditional museums. But MoPi is making art available to everyone. The Associated Press reported this story. Alice Bryant adapted it for VOA Learning English. George Grow was the editor.